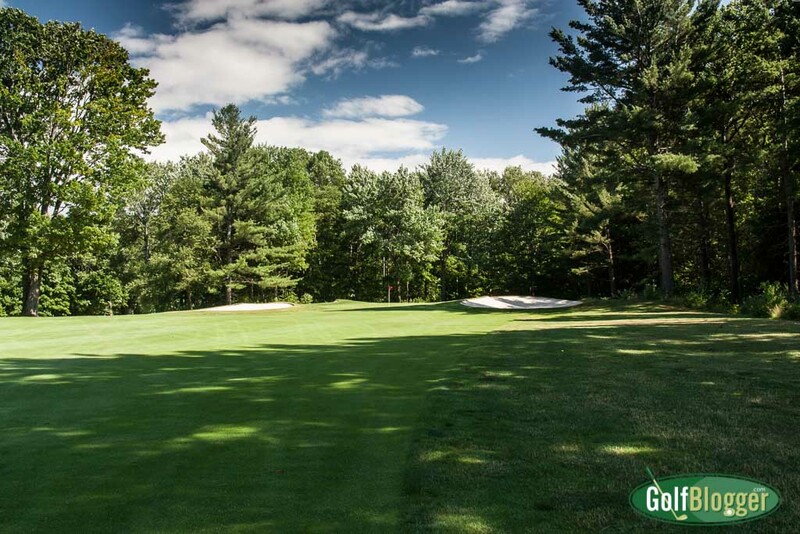 The Heather at Boyne Highlands celebrates its fiftieth anniversary in 2016. It has aged well. Designed by the legendary Robert Trent Jones, The Heather oft reminded me of one of his dictums: to make every hole “a difficult par, but an easy bogey.” I played bogey golf at The Heather and am quite proud of my accomplishment. From the tips, The Heather stretches to 7, 143 yards and plays to a 75.4/147. I played the middle tees (the Orange), which measure 6, 207 yards and play to a 70.3/139. For the vast majority of courses and bogey golfers, I recommend playing from the tees closest to 6,000 yards. That’s plenty of golf course in most instances; it is absolutely plenty at The Heather. Fairways at The Heather are generous. A golfer who plays under control should have no trouble finding the short grass. I missed just one fairway the entire round (and boy did that cost me). The approach shot on The Heather’s fourteenth hole. 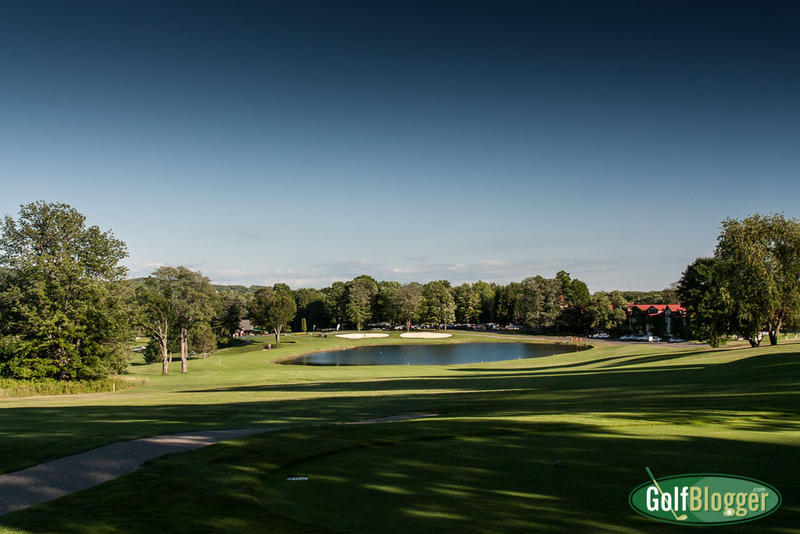 Getting to the green from the fairway, however, can be a challenge. Greens are well protected by bunkers, often offering only the most narrow of paths for a rolling ball. Further, the greens are frequently elevated. Sometimes, as with the fourteenth, there is absolutely no option but to fly the ball into the green. This, then, is where the “difficult par, easy bogey” design philosophy shows itself. 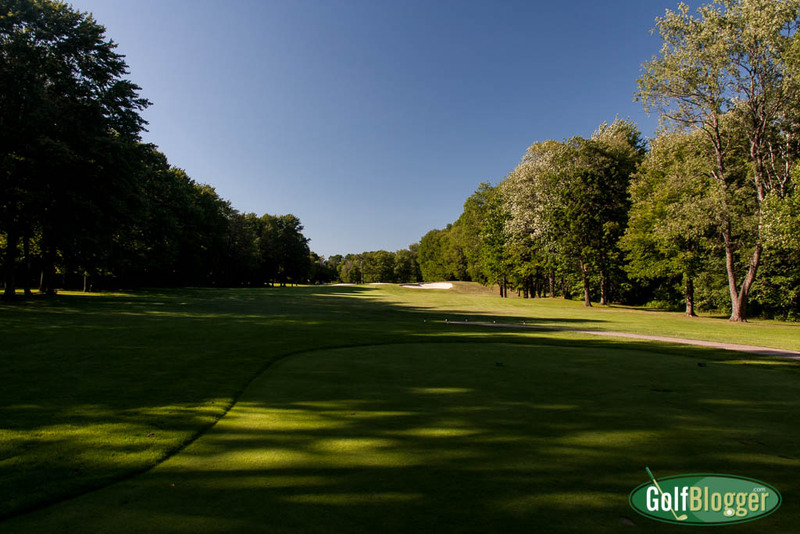 Following a solid drive (from the proper tees), a player often is left with a six, seven or eight iron into the green. The question is whether you will be able to throw the ball high enough in the air, with enough spin, enough distance and the correct line to clear the bunkers, and hold the green. Miss the mark on any of those variables (height, spin, distance, line), and you’ll find yourself in one of RTJ’s trademark facing bunkers. If you can get out of the bunker in one, the greens are puttable, and there’s your (relatively) easy bogey. The 17th at The Heather is a 403 yard par 4. My solution was to avoid the bunkers entirely (I did not get into a single one) by playing a ball short and to the front of the complex. Then, I could pitch a ball up to the putting surface with a wedge of some sort. Again, (relatively) easy bogey — or a one putt par. The nice thing about my strategy is that a short or wayward drive doesn’t change the equation. On the other hand, a longer than expected drive, or one in a premium spot with an angle to an open green, lets me try for par. The holes that do have open fronts are an invitation to grip it and rip it. Study the card, note the greens complexes, and plan for your par opportunities accordingly. Conditions on the day I played were very good — what you would expect from a premium resort course. One fairway — the seventeenth — had some interesting brown spotting, but it was nothing that affected play, just aesthetics. The Heather’s fourteenth is a 418 yard par 4. My favorite hole was the par four fourteenth. Measuring 354 from the orange tees, it turns slightly left with a fairway bunker guarding the right. That bunker is on a little ridge that extends across the fairway. The bunker and ridge are perhaps 180 from the tee, so a good drive will get it past. But … if you’re off line to the left or right, you’re in trouble. Following the drive, you’ll need to assess the situation: are you close enough — and do you have the angle — to fly a ball high into the wide, but relatively shallow green. A shot from the left side is your best bet, so try to draw the ball to that side. And then there’s the eighteenth (photo at top). From the orange tees, the pond is about 250 yards straight away. From the edge, it is at least 170 over the pond to the green. A player who doesn’t have those chops needs to think about playing the tee shot left, then hitting a short iron to the middle of the narrow fairway to the left, and then another to the green. It’s tough, and requires discipline, but you can get par here, even if you’re not a big hitter. The Heather at Boyne Highlands is quite walkable, and I recommend that you do so. A nice touch: As I was walking between six and seven, I heard bagpipes playing in the background. I don’t know if it was an end-of-the-day kind of thing, or if they play regularly. It put me in a good mood, though. Pricing at Boyne Highlands’ Heather is good. You can get a mid-week, twilight rate of $72. Twilight in Northern Michigan is always the best time to play. Last light in Northern Michigan throughout July is somewhere between 9:30 and 10:00 pm. If you haven’t finished a round of golf in the fading light at 9:30 pm, you have something to add to your golf bucket list. Golden. Weekend prime rates are as high as $144, but it seems as though Boyne Highlands frequent has deals on their website. Interestingly, A Difficult Par, the definitive biography of Robert Trent Jones, lists The Heather as a 1968 design. I’m sure that Boyne has the correct date, though. Officially, The Boyne Golf story begins with the purchase in 1955 of a failing ski resort by Everett Kircher. 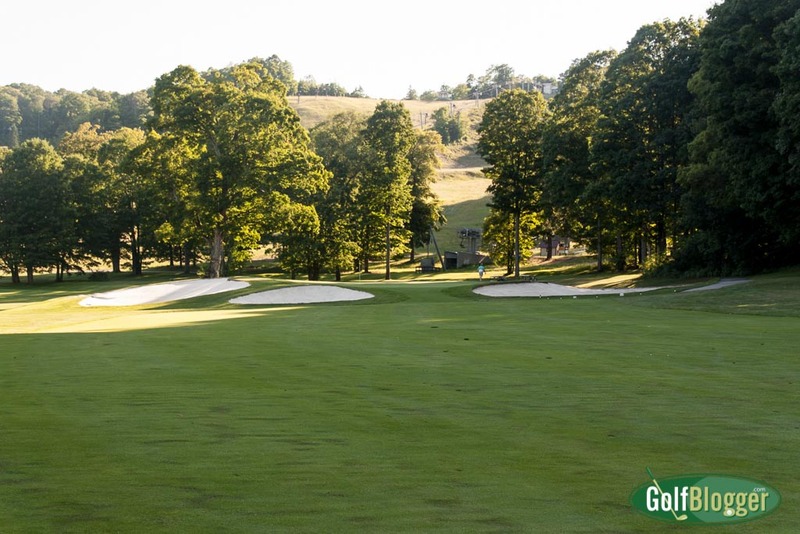 In an effort to bring more summer business, Kircher began by creating a nine hole executive course at Boyne Mountain. Thinking big, Kircher then hired Robert Trent Jones to build the resort’s first full sized course. It was called The Heather in keeping with Boyne’s Scottish theme (it was thought that Northern Michigan resembled the Scottish Highlands). By 1971, The Heather was on Golf Digest’s Top 100 US courses list. 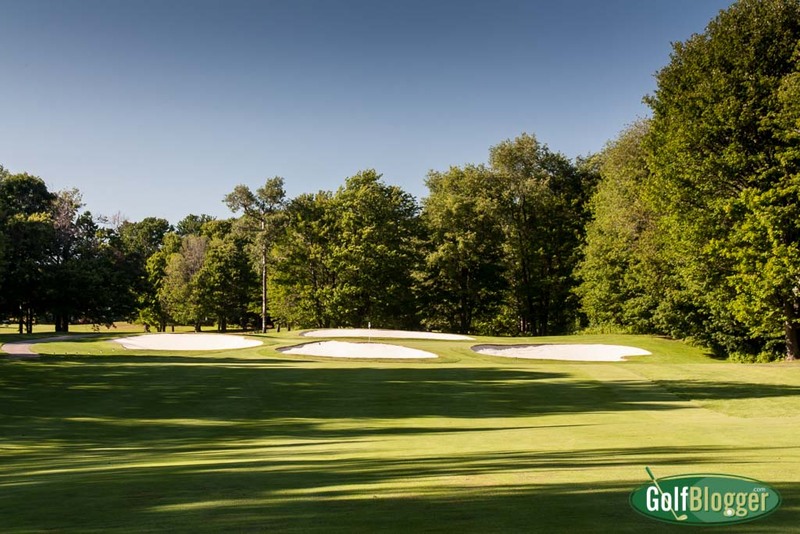 The Boyne Highlands The Heather golf course review was first published July 14, 2016, from notes on a round on July 9, 2016. The first at The Heather is a 383 yard par 4. The second at The Heather is a 403 yard par 4. Approach to the second at The Heather. The Heather's third is a 403 yard par 4. From the fairway on the third. A view of the Boyne Highlands ski areas from behind the third green. The Heather's fourth is a 202 yard par 3. The Heather's fifth is a 560 yard par 5 that wraps around a pond. From the fairway on the fifth. The sixth at The Heather is a 161 yard par 3. The seventh at The Heather is a 406 yard par 4.
from the fairway on the seventh. The eighth at The Heather is a 450 yard par 4. The ninth at The Heather is a 617 yard par 5. From the fairway on the ninth. The tenth at The Heather is a 416 yard par 4. The Heather's eleventh is a 550 yard par five. The twelfth at The Heather is a 174 yard par 3. The thirteenth at The Heather is a 419 yard par 4. The Heather's fourteenth is a 418 yard par 4. The Heather's fifteenth is a 506 yard par 5. The sixteenth at The Heather is a 196 yard par 3. The seventeenth at The Heather is a 403 yard par 4.